Carlisle. Carlisle Citadel Station, currently in the throes of a £14m repair programme, was built in 1847 for a consortium of six (later seven) separate railway companies. One of the smaller partner companies was the Maryport & Carlisle Railway whose main line we now take. The site of its first operations in the city is evidenced on the right by the sign reading “Maryport & Carlisle Goods & Coal Depot”. The M&CR’s first terminus station was at Crown Street. As we depart we pass on the right the stark concrete Carlisle Power signalling centre, which since 1973 controls all rail operations in and around Carlisle. To the left the line to Newcastle and Leeds drops away as our line turns sharply westward leaving the main line heading south to Preston. We then cross over the goods lines built to avoid the station and take up a south-westerly course to follow the valley of the River Caldew. The vacant land on our left was the site of the Currock engine depot of the Glasgow & South Western Railway and later became the Carlisle goods wagon repair works. Cummersdale. The fabric print works of Stead McAlpin is seen on the right across the river. Here a station was provided in 1858 by the M&CR but closed in 1951 along with several other lightly-used stops on the line. The station was close to Carlisle racecourse and after closure continued to see occasional use on race days. We cross the River Caldew and the Cumbria Way footpath on Cummersdale viaduct. Dalston. Approaching our first station call we pass on the left the extensive Nestlé milk processing factory – the largest in Europe – which used to be rail-connected. Leaving the station, there is on the left a siding into a large oil terminal which receives trainloads of fuel each week from Grangemouth refinery and now provides the only regular freight flow on the former M&CR system which once earned most of its money from carrying goods. Curthwaite. On the right hand side of the line a former water tower of the M&CR survives at the site of a station at West Curthwaite. It opened in 1843 and closed in 1950. The platforms have been removed and the station house is now a private dwelling. The water tower, painted red and cream, sits next to the house and bears a maker’s inscription ‘Hareshaw Ironworks, Hexham, 1843’. The tower is Grade 2 listed. Crofton. The platforms have also been removed at what had been a private station for the Brisco family of Crofton Hall. The station house on the left of the line is now a private dwelling. Crofton Hall was demolished in 1958 and the estate sold. Wigton. Our second stop is at the birthplace of Melvyn Bragg and at one time a town distinguished by the noxious odour emitted by its cellophane factory. The ‘Factory’ to the left of the railway line is now owned by Innovia Films Ltd – “leading global producer of speciality high performance Biaxially Oriented Polypropylene” aka the new £5 note.Redolent of earlier times of rural employment is the surviving tower of Old Lane Mill, to the left of the station. This was surveyed in the 1970s by Mike Davies-Shiel and is the sole survivor of four windmills that once existed in Wigton. Brookfield. Nothing remains of this station which had a life of only a few weeks in 1844/5. Construction of the M&CR began from the Maryport end with the object of carrying coals from local pits to the port. The first section from the South Quay to the pits at Arkleby opened in 1840 and was extended to Aspatria in 1841. Construction from Carlisle to Wigton was completed in 1843. A year later the Wigton end of the gap was reduced by an extension to Brookfield at the western edge of the town. A through route was finally completed in 1845 when the Brookfield station went out of use. Aikbank Jct. The site of this junction is lost on the left in a jungle near a bridge over the infant River Waver. It was the eastern end of the Bolton (or Mealsgate) loop line from Aspatria begun in 1866 to tap the coal pits being developed in the land around Baggrow and Fletchertown. This north end of the branch was little used. Leegate. This station opened in 1848 and closed in 1950. It superseded a short-lived halt at Low Row which, like Brookfield, lasted only until the final gap between Aspatria and Wigton was closed. Brayton. The M&CR opened a station here, initially named Heathfield. It was for the exclusive use of Sir Wilfrid Lawson of nearby Brayton Hall and estate tenants. In 1870 Brayton became a junction station for the 25 mile long Solway Junction Railway which crossed the Solway Viaduct to join the Scottish railway system at Annan. It is just possible to discern the remains of the trackbed of the SJR among the trees to the right of our line. Extensive sidings were located on the north side of the M&CR line for the marshalling of coal and iron ore traﬃc from West Cumberland destined for the Glasgow area. The SJR had a short and chequered life. Passenger traﬃc was always sparse and freight declined as the Cumberland iron mines closed. The viaduct which suﬀered repeated damage was closed in 1921 and demolished along with the connecting lines. Aspatria. Aspatria is a sleepy town, being the HQ of mattress manufacturer Sealy, whose factory is to the left of the line entering the station. The First Milk Creamery here produces 60 tonnes of cheese daily and is the third most popular Cheddar brand in the UK. The station stands at a distance from the centre of the community and on early maps was named Hayton. The arrival of the railway in 1842 stimulated the expansion of coal extraction in this northern extremity of the West Cumberland coal measures. The loop line to Mealsgate, opened in 1866 and extended through to Aikbank Junction in 1878, branched oﬀ at the Carlisle end of the station to serve several coal pits. Passenger trains ran as far as Mealsgate until 1930. Arkleby. This was briefly the northern end of the first section of the line built from Maryport, completed in 1840, but closed once the line was extended into Aspatria. On the left are the remains of Wardhall lime works to which an incline descended from quarries near Eweclose nearly a mile away to the south-east. Bullgill. This station served the parish of Oughterside and remained open from 1840 until 1960. From 1867 Bullgill was the junction for the M&CR branch line to Brigham and Cockermouth. This line was built primarily to handle iron-ore traﬃc although it did carry a passenger service until 1935. Remnants of the westbound platform alone survive on the left as we pass. Dearham Bridge. Our route now follows a delightful course beside the River Ellen. This station, opened in 1840, was originally named Dearham, a village less than a mile to the south. The word Bridge was added in 1867 when a station slightly closer to that village was provided on the Brigham branch line. Birkby Fire Brick Works and Colliery formerly occupied the land beside the station but this evidence of industry has all but vanished. Maryport. Maryport has only ever had a single platform for its passenger services and the M&CR located its head oﬃce on it. The promoters of the Railway had the avowed object of competing with Whitehaven in the exporting of coal. The expansion of the northern coalfield assisted by the opportunities coming with the new means of transport meant that by 1846 Maryport was shipping out tonnages of coal equal to those from Whitehaven. By comparison their carriage of passengers by rail was small beer. So little regard was given to the interests of human cargo that the M&CR built the elegant bridges over its line with slab stone abutments that had a clearance of as little as a foot with its railway carriages. To this day the passenger rolling stock allocated to the line has bars fixed across opening windows. In its heyday the bulk of the traﬃc on the M&CR would continue past the passenger station and turn sharply to the right to reach the harbour. The M&CR remained independent and highly profitable until the railway grouping of 1923. Coming from Carlisle the yellow-painted mileage boards on the left-hand side of the line have been counting down from over 27 at Carlisle to 0 at Maryport – the point of origin of the line. From here a new sequence begins, counting down to Whitehaven, as we leave the M&CR and join the tracks of the Whitehaven Junction Railway. Flimby. In 1835 the scheme supported by the Earl of Lonsdale to promote a railway line from Whitehaven to Carlisle had been scuppered by the successful launch of the M&CR. In 1844 a more limited project was hatched to build a line to connect Whitehaven with Maryport and so link into the M&C route. That year the first Earl died but his son, the second Earl, became chairman of the Whitehaven Junction Railway and remained so for its entire existence. It proved a problematic obligation. Although the WJR had George Stephenson as its nominal engineer, the line was laid out by his assistant John Dixon. A catalogue of poor judgments and miscalculations delayed the opening of the line and compromised its entire future operation. Leaving Maryport our line is soon closely skirting the shoreline. Flimby station, opened in 1846, serves a former coal mining village. Several pits were located in Flimby Great Wood set on the rising ground inland of the village. The square red brick building on the left before the station is the remains of the Risehow colliery. Here for many years was a battery of by-product recovery coke-ovens. The final coal to leave the Cumber- land coalfield was opencast fuel loaded at Flimby for despatch by rail to power stations at Padiham and Fiddlers Ferry at Widnes. St Helen’s Halt. Ahead the turbines of Siddick Wind Farm herald some examples of West Cumbria’s industrial regeneration. We pass the crumbling concrete platforms of the former St Helen’s Halt which was provided for miners working at St Helens No 2 pit which flooded and was abandoned in 1921. On the left side of the line is first the biomass-fuelled combined heat and power plant linked to the adjacent Workington Paperboard Mill of Swedish company Iggisund. Formerly known as Thames Board Mills and owned by Unilever, the site was taken over by Iggisund in 1987. Some of the feed-stock timber and wood pulp is shipped in through the port of Workington. Despite its proximity, no attempt has been made to install a rail connection to the plant. Workington North. St Helen’s No 3 pit remained in production until 1966 and generated a huge waste heap to the left of the main railway line. Siddick Junction and station (1880-1934) was located here and the colliery was in the fork of the WJR line and the northern end of the Cleator & Workington Junction Railway, the embankment of which may be spotted to the left at the rear of the Dunmail Park ASDA. An emergency station named Workington North was speedily erected after the devastating floods of November 2009. A shuttle service of trains provided by DRS was run from here to overcome the separation of Northside from Workington town centre. To the right a branch line runs into the Port of Workington where there are regular transfers of goods for onward carriage by rail. On the left our route was formerly joined by the rails of the Cocker- mouth & Workington Railway which carried trains from Penrith via Keswick. Crossing the River Derwent the replacement road bridge can be seen upstream on the left. Workington. In LMS days this station was called Workington Main, which still features in the name on the signalbox. To townsfolk it is still referred to as ‘Low station’. [A station on the old Cleator & Workington Junction line was called Workington Central but closed to passengers in 1931.] The first station provided by the WJR comprised a single platform devoid of any kind of shelter at a place called Priestgate Marsh. The present buildings of yellow Crewe brick were erected after 1866 when the London & North Western Railway took over the WJR to establish a toehold in West Cumberland via their line from Penrith via Keswick. Much of the reason for the eagerness for access to Workington on the part of the big railway operators has now disappeared. As our train leaves the station we pass on the left the vacant site once occupied by the large railway locomotive depot that was needed to provide motive power for the busy local traﬃc. On the right are the remains of the northern exit for the extensive fans of sidings that served the huge iron and steel complex that once extended south for over a mile. A section of the former Chapel Bank Works is still operated by Tata Steel but otherwise the entire site has been levelled and is now being prepared for redevelopment. Retail outlets and commercial warehouses located on the left of our route occupy the former site of Solway Colliery sunk by the United Steel Companies in 1937. On the right of the line as we reach the southern limit of the Moss Bay site there are the remains on the shore of one of the slag dumping lines, marked by the row of conical-shaped lumps of iron-rich slag. Harrington. Harrington has a rich industrial history and an excellent website. Its harbour is seen on the right. Up to 1900 this was a busy port exporting coal from local pits and shipbuilding thrived for a century until 1880. From 1857 an ironworks with four blast furnaces occupied land south of the harbour and was demolished in 1934. During WW2 this site was the location for a ‘secret’ factory known as Harrington Shore Works, from 1941 producing magnesium from seawater. The harbour was converted into a reservoir for the plant. The project was suspended at the end of the Korean war in 1953. The wide grassed area south of the harbour was once occupied by many of the streets of the village which post-war became the subject of a slum clearance scheme due to the heavy contamination caused by the magnesium factory. The next two miles of our route sit on a ledge along the shoreline at the foot of unstable cliﬀs which continue to threaten the safely of the railway line – an engineering folly. Over a mile of the line has been reduced to single track protected by a barrier to arrest falling rock. On the inland side of the line there is evidence of steps taken to manage drainage while on the seaward side regular heavy maintenance is required to stem tidal damage. Parton. On the left as we arrive at Parton we pass the not very prepossessing structures of the sewage works. These cover the site of the Lowca Engine Works of Messrs Fletcher Jennings of which no traces now remain. The Works operated from 1857 to 1912 producing small industrial locomotives for home and overseas railways and a variety of other iron products. A branch line from Distington which also served Harrington No 10 pit at Lowca joined the main line here. The remains of a stone retaining wall for this line is visible above the road on the left. The port here predated the rise of Whitehaven as the main outlet for local coal and the village also boasted a brewery and a glassworks. Whitehaven. The harbour comes into sight as we round Redness Point. Approaching the station, the shelf of land on the left 0nce housed the Lonsdale Ironworks and the ill-fated William Pit where in 1947 104 miners perished. In the 18th and 19th centuries the town found its prosperity in coal and tobacco. 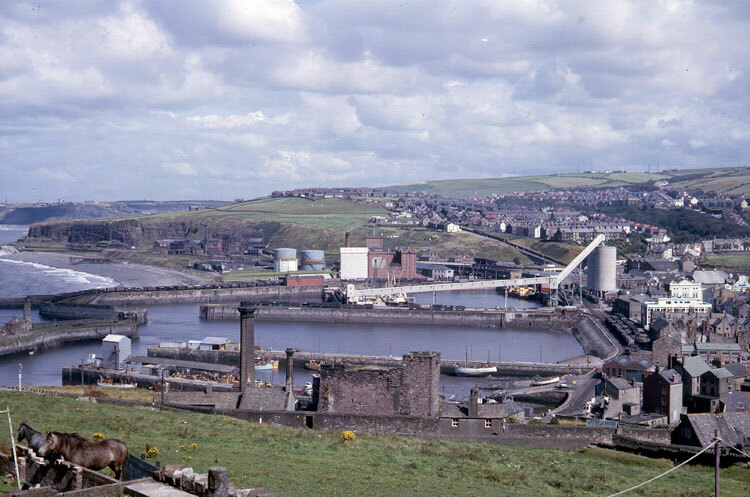 Gone now are the coal staithes on the far hillside as are the tall silos that once received phosphate rock from Casablanca for the Marchon Chemical works. Commercial cargo handling at the port ended when phosphoric acid production ceased in 1992. Whitehaven retains a few fishing vessels but the harbour is now essentially a marina for leisure craft. The station – locally always referred to as Bransty station, being in this area of the town – dates from 1847 and was the terminus of the WJR line along which we have travelled from Maryport. In busier times a set of tracks ran down the seaward side of the station to skirt the harbour and reach a rope-worked incline that delivered coal wagons from the pits on the high ground south of the town. On the far side of the harbour stands the ‘candlestick chimney’ through which foul air was drawn from Wellington Pit. The platform our train occupies dates from 1852 when Whitehaven Tunnel (1,333 yds long) was driven under the High Street and below Hospital Hill to connect with the Whitehaven & Furness Junction Railway which had already reached Whitehaven from the south in 1849. Corkickle. This was Whitehaven’s other station, again acquiring its name from the locality. In the days of a sleeping car service from Euston to West Cumberland this was where passengers for the town were required to alight as clearances through the tunnel were too tight to accommodate the sleeper carriages. At the southern end of the station there used to be an unloading dock for fuel tank wagons. The original terminus station of the W&FJR was located at Preston Street a short distance west. Corkickle opened in 1855 after which Preston Street became the town’s Goods Station. In 1881 an inclined wagonway known as the Corkickle Brake(525 yds long) was built on the hillside to the right. This was used to lower wagons of coal from the Lonsdale Colliery’s Croft Pit. It closed in 1931 when the pit became uneconomical but was revived for use by Marchon. Mirehouse Junction. The area south of Corkickle station was in past times a busy freight yard with two signal boxes and an allocated shunting locomotive. As well as traﬃc to and from Marchon via the Brake, train loads of iron ore and limestone arrived from Egremont and Rowrah by the Whitehaven, Cleator & Egremont Railway line which joined the W&FJ line at Mirehouse Jct. Conveying these tonnages of freight over their rails earned the W&FJR rich returns. To reduce haulage costs to Workington the ironmasters eventually sponsored their own line – the Cleator & Workington Junction Railway – to avoid the route via Whitehaven tunnel. St Bees. For the final few miles our route takes us on a section of single track along the tranquil St Bees valley. The peace and quiet may soon be threatened by the prospect that accommodation for the workforce for the construction of the proposed new nuclear power station at Moorside near Sellafield could be built close to the railway near the Mirehouse Road bridge. If this goes ahead there is a scheme to build a new station to enable workers to commute by train. The impending revival of coal mining in the former Haig Pit oﬀshore reserves would also impact on the railway hereabouts. The outline proposals indicate that output from the mine will emerge by way of a long drift ending at a loading facility close to Stanley Pond a little south of the projected new station. If one or both of these developments comes to pass we can look forward to some action from Network Rail to reinstate some of the infrastructure that has been lost from their Cumbrian Coast line.